Photo shows whole L-Shaped property for sale. 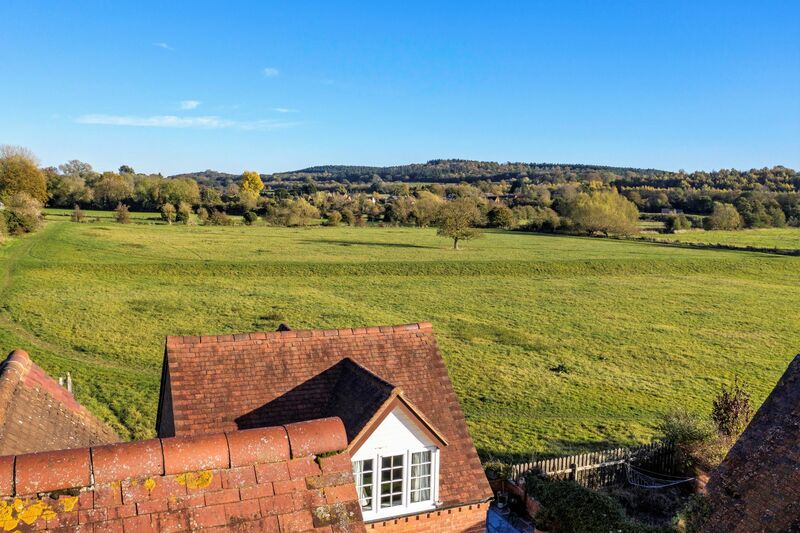 An exceptionally well presented and generously extended, period, semi detached character cottage, boasting stunning rear aspect field and countryside views. 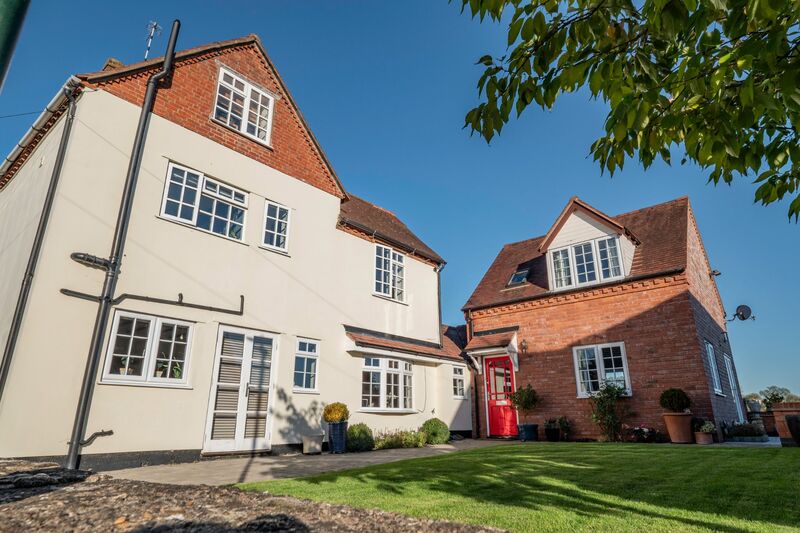 Ideally situated on the outskirts of the town, whilst conveniently located within close proximity to the historical town center high street and popular field and riverside walks. Benefitting from double glazing, gas fired central heating and having stylish family living accommodation comprising: reception hallway, lounge, dining room, comprehensive refurbished breakfast/kitchen, refurbished cloaks/utility, renovated cellar, master bedroom with refurbished en-suite, a further double bedroom, bedroom three/study and luxury refurbished family bathroom. Delightful laid to lawn fore-garden with block paved drive way parking and charming feature paved patio terrace. 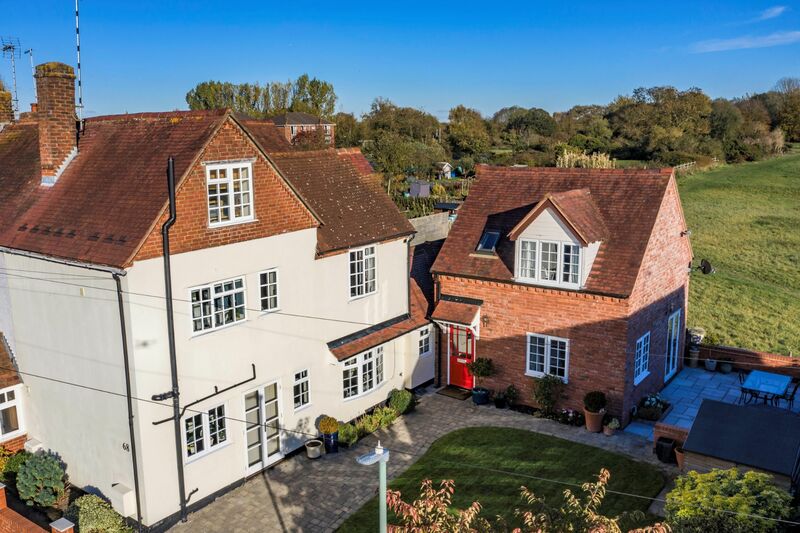 Access to the property is gained via a decorative block paved drive and footway providing parking space for one car and leading to an open pitched tiled canopy porch with outside light and attractive sealed unit panelled double glazed front entrance door giving access into the reception hall. With feature flagstone flooring, upvc panelled double glazed window to the side elevation, single radiator and panelled doors off to the refurbished utility/cloakroom and understair storage cupboard. Panelled glazed stable style door giving access into the dining room and panelled glazed door off to the lounge. Enjoying sealed unit double glazed double doors overlooking and giving access out onto the paved patio to the side elevation, upvc panelled double glazed windows to the front and side elevations and upvc panelled double glazed window enjoying stunning field and countryside views to the rear elevation. Painted feature exposed ceiling timbers, two double radiators, built in understair storage cupboard, overstair sealed unit double glazed roof light to the rear roof slope and stairs with handrail rising to the first floor master bedroom with refurbished en-suite shower room. Boasting feature exposed ceiling timbers, upvc panelled double glazed bow window to the side elevation, single radiator and feature hardwood effect Karndean flooring continuing through with entrance way giving access into the inner stairwell lobby with upvc panelled double glazed window to the side elevation and further stairs with handrail rising to the first floor landing. Panelled door off to the stylishly refurbished breakfast/kitchen. Having a comprehensive range of matching eye and base level units to include: work surfaces with splashback wall tiling in part, single bowl sink unit with mixer tap, breakfast bar, integrated dishwasher, integrated freezer, integrated fridge with storage cupboards above and below and inglenook style recess housing the Rangemaster cooker range with lintel beam over. Slimline spice and tray rack base units, three deep drawer base units, pull out rack base unit, pull out bin base unit, plinth heater and feature hardwood effect Karndean flooring. Upvc panelled double glazed window and sealed unit panelled double glazed double doors overlooking and giving access out to the driveway and door providing access to the cellar stairs. Having a matching contemporary style vanity range suite comprising built in low flush push button WC, vanity unit wash hand basin with mixer tap and panelled recess providing space and plumbing for washing machine and space for condensing tumble dryer. Wall mounted gas fired combination boiler with small built in storage cupboard below, feature floor tiling and upvc panelled double glazed window enjoying stunning field and countryside views to the rear elevation. Being fully lined with double radiator and two wall extractor fans. Enjoying a dual aspect via upvc panelled double glazed dormer window to the front elevation and upvc panelled double glazed dormer window enjoying stunning field and countryside views to the rear elevation. Ceiling loft hatch, single radiator and panelled door providing access into the stylishly refurbished en-suite shower room. Having a matching contemporary style white suite comprising close coupled push button WC, vanity unit wash hand basin with mixer tap, wall vanity mirror cabinet over and corner glazed shower enclosure with glazed pivot door, wall mounted electric shower unit and splashback wall tiling. Ceiling extractor fan, heated towel rail ladder radiator, feature tile effect vinyl flooring and sealed unit double glazed roof light to the front roof slope. With upvc panelled double glazed window enjoying pleasant views to the side elevation, coving to ceiling, single radiator and stairs rising to the second floor attic bedroom three/study. Panelled doors off to the first floor double bedroom two and refurbished luxury family bathroom. With coving to ceiling, full width built in wardrobe with sliding mirrored triple doors, single radiator and upvc panelled double glazed window enjoying pleasant views to the side elevation. Having a comprehensive, contemporary style vanity range suite to include: close coupled push button WC, vanity unit wash hand basin with mixer tap and wall mounted vanity mirror over, panelled bath with mixer tap and spacious glazed shower enclosure with wall mounted deluge mixer/body spray shower unit. Feature splashback wall tiling in part, feature tile effect Karndean flooring, ceiling LED spotlights, wall extractor fan, heated towel rail ladder radiator, wall shaver socket and upvc panelled double glazed window enjoying pleasant views to the side elevation. With feature exposed roof timbers in part, single radiator, upvc panelled double glazed window enjoying pleasant views to the side elevation and over stair loft access door (loft being substantially boarded for storage). There is a block and brick built garden wall frontage to a shaped laid to lawn fore-garden complimented with border shrubs, evergreens and ornamental tree feature. 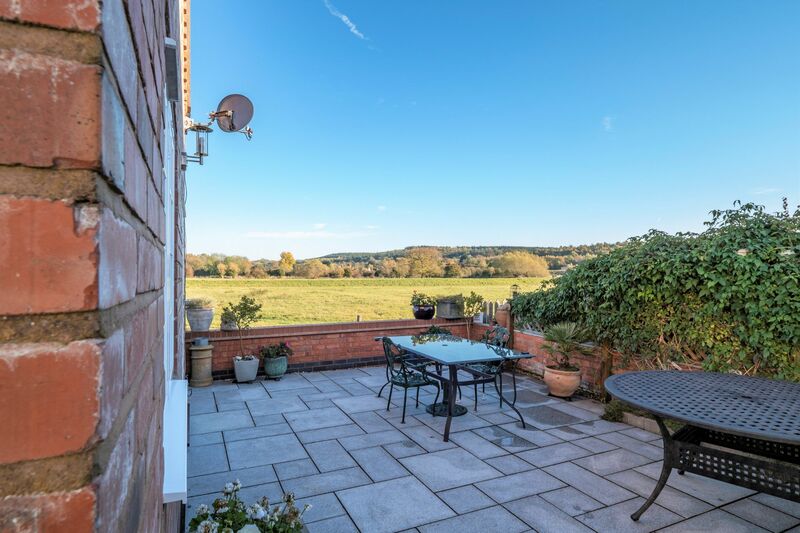 Outside power, outside cold water tap, outside manual/security sensor lighting, garden shed with power and a charming feature paved patio with wheelie bin store, brick built wall features and boasting stunning field and countryside views to the rear elevation. The patio benefits from having wall attachments to accommodate privacy sail screening (all to be included).